Should you, do you need to, provide winter protection for Japanese Maples? Japanese maples planted in the ground usually do not need to be covered. It depends, but you have to be really careful that you don’t do more harm than good in your effort to protect your plants from the cold. So first, let me explain a little about climates and growing conditions. I’m in northern Ohio, zone 5. It gets cold here. Bitter cold at times, wind blowing, blizzard like conditions. During the winter it’s not unusual for us to see temperatures as low as 15 degrees F. some winters we have days and days of single digit temperatures and possibly a few days around zero or below. In this climate I grow Japanese maples and a lot of them. How do I protect them during the winter? For the most part I make little or no effort to protect my Japanese maples against our blustery winter conditions. All of my Japanese maples are planted in the ground and at this time none of them are in containers setting on top of the ground. That’s a really important factor. All plants are almost always happier, and safer when planted in the ground. Providing of course, the soil is acceptable and well drained. Very few plants like soil that is wet and heavy and for Japanese maples wet heavy soil is about the worst thing that you can do to them. So . . . with that said, are your conditions similar? Is there any reason for you to provide additional protection for your tree or trees? If you are in warmer zone than my zone 5, you should have even less to be concerned about than I do. However, if you still feel that you need to provide extra protection, there are a few things you should know about protecting plants for the winter. Wrapping plants in burlap will help to keep the wind off them. How much it helps is really debatable and I’ve never wrapped anything in burlap. Some people who have evergreen hedges etc. near the road where they can get splashed with road salt often wrap them in burlap, and at best I’ll say that it can’t do any harm and might help a little. You just have to keep in mind that once it gets cold the burlap will not stop the cold at all, but it will break the wind and help to keep the foliage of the plant from getting dehydrated. Plants in containers need winter protection. Here in the north, especially in my little town of Perry and Madison Ohio, we have dozens and dozens of large whoesale nurseries who grow millions upon millions of plants in plastic containers above ground. The potting soil that they use is usually a mix of hardwood bark mulch or pine bark mulch. That growing mix dries out easily! Once of the major concerns for these nurseries when they over winter their plants is keeping the plants moist enough. Even when plants are dormant for the winter, it is essential that the roots receive an adequate amount of water, but at the same time not too much water. They have to be moist, but they cannot be soaking wet. All of these very experienced wholesale growers use the same techniques and same strategies when it comes to getting their container grown plants safely through the winter. Because they know that they have to cover for the winter the majority of these plants are grown in hoop houses that are completely uncovered during the growing season, the summer, spring and fall months. These “hoop houses” as they are called are not greenhouses. They have no heat, no glass, and they are not covered with clear plastic. Come winter, usually around but not before Thanksgiving they start covering these houses with white plastic. It’s called over wintering film and they use white because the white film actually reflects the rays from the sun. They don’t cover their plants to keep them warm. They don’t want them warm. They want them dormant and they want them to stay dormant. So they use white plastic so the temperatures inside the hoop house remain as constant as possible. Does it freeze in there? Yes, absolutely it freezes inside of these hoop houses. The soil in the pots freezes rock hard and the containers freeze to the ground. But once frozen the white plastic keeps things frozen. The worst case scenario is to have the plants freezing, thawing out, heating up then re-freezing. That would be fatal for the plants. So if you intend to cover your Japanese maples for the winter, keep this in mind. Use white plastic not clear plastic. The only time a nursery uses clear plastic is if they are covering a house that is going to be used as greenhouse that is going to be heated day and night. In that case they cover with two layers of clear plastic and then with a little blower they blow a layer of air between the two sheets of plastic. This layer of air is the insulation. But in this scenario the plants are kept nice and warm and they are not dormant. They are actively growing. But that would not be good for Japanese maples because they need to go dormant for the winter. They, like all other deciduous plants need to rest. Winter is when they rest and recharge their batteries for the upcoming spring season. So in short. White plastic is used to over winter dormant plants and clear plastic is used for growing plants in a greenhouse type of situation. The lower the over wintering structure the better. If you decide to build some kind of a structure over your Japanese maples for the winter the lower the structure the better. Yes, wholesale growers use rather high structures. Hoop houses tall enough that you can walk through. The reason that they build their hoop houses so high is because throughout the growing season they have to be able to walk under those hoops as they care for their plants. However, because their structures are high that leaves a lot of air space between the plants and the top of the hoop house. That air pulls moisture from the plants and they have to water at least every two to three weeks, even during the winter. If you don’t water, or can’t water because the water lines are all frozen, the plants will die. You can and should eliminate all of those issues by building your over wintering structures as low to the ground as possible. Keep in mind that the ground is naturally warm and actually gives off heat during the winter. The closer to the ground you build your structure the more you benefit from that ground heat. That also means less dead air space above the plants and a more effcient use of the moisture inside your structure. Another trick that I’ve used is to build the structure using two by four lumber and make it flat on top, then pull the white plastic over that. Weight the plastic down on the edges with soil by digging a shallow trench around the structure. By placing soil over the ends of the plastic in the shallow trenches you can pull the plastic really tight, which is very important because if the plastic can move, it will start flapping, tear and blow off. Of course with a structure that is flat on top puddles of water develop on top of the structure, but then I just take a pitch fork and poke holes in the plastic where the puddles are. The water in puddles drains into the structure, raising the overall humidity inside which is good for your Japanese maples and other plants. You can also build a low structure using PVC pipe bent in a hoop slipped over top of re-bar that is driven into the ground. However, keep in mind that PVC pipe, or a low flat structure will not hold up to a snow load, so you should install some vertical braces and or keep the snow pushed off the top of the structure. You’d be amazed at some of the structures that I’ve seen come crashing down under snow load. Even large, commercial hoop houses made of steel pipe can and will come down under snow load. It’s usually a combination of crazy winter weather that contributes to these crashes. Snow, freezing rain, more snow, then rain. Things that cause the snow to not slide off of the plastic. With a flat structure there is no sliding that will take place. You have to be out there with your push broom removing some of that weight. I learned this the hard way. Woke up one morning in early November to the most beautiful, clinging snowfall I’d ever seen. The snow came down so fast that we had 24″ of snow and no electricity before we even got out of bed. By that time my flat structure over my grafted Japanese maples was already down. Fortunately only one end collapsed and it happened to be the end where there were no plants. It was lesson learned. The two by fours that I used for legs were nailed to the top, not bolted. That allowed them to fold under. But what I really needed was a few verticle four by fours supporting the center of the structure and it would not have come down. like tο shoot you an email. I’ve got some ideas for your blog you might be interested in hearing. Either way, great blog and I look forward to seeing it grow over time. I am curious- how did your tree do over the winter last year? I would think the dryer vent would not have been a good option. I think I am moving mine inside but it is about 300 lbs. A Japanese maple really needs to be outside for the winter. They need to go dormant and rest. That won’t happen inside. A cold garage is much drier than you think, outside is really the best place for them. I have 2 purples ghost maples and one red dragon that I got thru Amazon but they are small only about 2 feet high or less. Was reading about the white plastic cover and wonder if a white plastic bucket would help them winter safely with mulch around on the ground. I don’t want them dead but they are small and worry they will not winter well. Chances are they should do fine, but if you really want that extra protection I don’t see why a white plastic bucket wouldn’t work. Just wait until they are completely dormant before you cover them and wet the ground, or cover when there is snow on the ground so they have plenty of moisture for the winter. But the soil around the bucket will get wet so that should be plenty of moisture for them. Snow cover is good for them, snow is a good insulator. this is my first experience with Japanese maples. These little guys just seem little and helpless. The Red Dragon is looking stronger and has had some healthy growth, Thank !! I will hope for the best. It certainly doesn’t get as cold here in Utah as it does there!! By the way, where is a good place to look for iron to keep them red and healthy? and how do you apply it? We live in southern Michigan. Just planted our maples and will be putting mulch down tomorrow, (young twigs). Do we need to worry about protecting from mice, rabbits, or deer? Only if you happen to cover them with white plastic, for sure you mouse bait. But they should be fine uncovered. Rabbits? They are not tasty but I have had rabbits bite them off. I am very concern thus, I have a few very important question. I planted two Emperor1 Japanese Maple about 3 weeks ago. They are about 3′ tall. I put mulch around them…. about 5 to 6 inches from the trunk. Also, I’ve been watering them every 3 to 4 days. Today is about 3/4 days I watered them but unfortunately, Tonight is going to be 30 degrees and the next day is going to be above 32 degrees is Wednesday. Do I wait until temperatures are above freezing or do I still water them? When do I stop watering these trees during the winter? Also, I planted yellow roses and applied the same procedures as the JM. Oh! I live in a mountain/high altitude(1,330′) In Blue Ridge Summit, PA and although the terrain is rocky it drains well. You also mentioned to another person(beth)that snow was good for trees as an insulator. Is it the same for my JM class? Thank you! At this point they probably have all the water they need until spring. Even then, be very careful not to over water them. Snow is good! With the fluctuating cold/warmth this month my Japanese maple has some green? It is very small and I’m afraid of loosing it what should I do to save it? Simply cover it with a blanket on nights that are about to dip below freezing. Hi Mike and thanks for all the great info! I live in Canada on the southern tip of Vancouver Island. I potted five 8′ maples, three Bloodgood/two Surya early this spring into large pots on the south-west area of my patio. They’ve been doing great and are healthy and growing well, with the help of a little Miracle Grow about every 3 to 4 weeks. Will you kindly tell me whether or not I need to keep drenching the plants once a week as I have been doing, or should I water them at all during the winter? Our winter season usually includes a lot of rain between November and March, occasionally a light dusting of snow, and 2 to 6 weeks of below 0% weather. If not, when should I stop watering them in the fall? Thanks for any info you can share! Right now I’d water twice a week then down to once a week. Once they are completely dormant, around Thanksgiving, you can water far less often, but when warm and dry you should still water about once a week. Safest thing to do is plant them or bury the pots in the ground over the winter. I planted a Japanese acer inabe shidare maple tree this spring. I live just outside of Toronto and it can get pretty cold. For the winter, should I wrap the tree with burlap or just put sticks around it with burlap? If I wrap it should it be tight? The truth is, not matter what you do you cannot stop the cold from reaching the tree. Unless it gets way below zero the tree should be fine. And if it gets that cold, not much you can do to help it anyway. Hello. I live in Chicago (zone 5) and have a Tamukeyama JM in a 18 in x 18 in pot. The leaves are about to drop. Should I bring it in my garage (currently 60F inside)(gets to 40F mid winter) or try and fit it in a plastic shed on south side of house that gets heat from sunshine OR leave it outside and build a protective (white plastic) structure around it? I have a baby Japanese maple plant that is 5 inches tall and has 5 leaves. It is in a plastic container and it is inside my house. I live in southern NC and I was wondering if I’m supposed to water it during the winter. And if so, how much water does it need? Yes it needs water, but not that much. Probably would have been better left outside where it could go dormant. Do you leave your trees in pots over the winter or do you plant them in. I just pack mine together tight, some leaves blow over the pots and they are fine. But your potting soil must drain well. I have some one year grafts which I got from Horace and Lisa a few months ago. They are potted in a good potting mix. Should I plant them in the ground for winter here in zone five in central michigan? That would really help to protect them. I have a Redbark jm seedling about 5 inches tall in a pot. I live in middle tenn. would like to overwinter but don’t know how. Should I plant it in the ground now or leave it potted? I would put it in the ground. Thanks for the helpful replies. 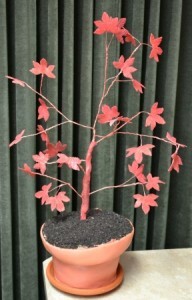 I have my Japanese Maple on our deck in a big ceramic pot–the pot is about 3 feet tall. I live just south of Lake Tahoe in the pine trees, bordering high desert. We have an unheated greenhouse and I am wondering if I should just move it inside. I’m thinking the ceramic will get really cold..maybe even below freezing at times. If I keep it outside I will cover with burlap on windy days, but just really concerned with freezing. What would you do? Not sure what zone you are in but here in Ohio I’d for sure get the pot off the deck and on the ground in a protected area. Drying is the biggest concern you have over the winter. Drying and freezing. If the soil is moist enough freezing isn’t an issue. In our area, Lake Tahoe, Nevada, the gardeners for our complex bind the bushes to protect them during the winter snow. Maple 🍁 tree. Is this advisable??? Last year I removed the binding…. This really shouldn’t hurt anything as long as they don’t break branches in the process. 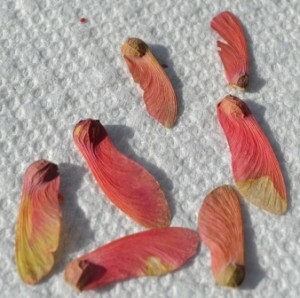 Sometimes Japanese maples are seriously damaged from snow and ice and the binding might prevent that.